I consider myself a crafter, defined as what I perceive to be a hobby. I mostly knit and spin, while occasionally dabbling in the sewing or dyeing project, creating as a general term. I consider architecture to be my professional field, having gone to architecture school and learned the design process and working in the design field as my day to day job. But inexplicably, I’ve always felt there to be a complete dichotomy between those two passions of mine. More recently, however, I’ve realized the innate relationship between the two disciplines. While some might see it to be obvious, the idea of creating and designing has finally become clearer. To get from the tail (beginning) to the arrowhead (perceived ending) the designer/creator will have to take a steps back for steps taken forward. In knitting terms, this means swatching, frogging, swatching some more, liking it, casting on, realizing it’s not quite right, frogging, swatching again, etc. In design terms, it means redesigning a floor plan and/or rearranging spaces, etc for the 100th time, sometimes (often) going back to an idea that was presented on day 1. I used to feel an overwhelming sense of frustration when this diagram came to fruition in my knitting process, yet still always considered myself a process knitter – the exact opposite of what could be considered a process knitter. But when I was enlightened with this knitting/design relationship recently, the swatching/frogging process became so much more enjoyable! It brought about a level of reassurance to trying to design on the fly, thinking “well, I can always frog back and start over if it’s not really what I want.” It even pushed me to swatch past what I thought I was satisfied with, to try new combinations, and find something else that I ended up liking even more. The fact that I’ve frogged more sweaters than kept due to the final product underscores the idea that beneath all of that swatching frustration, I guess the process of making it was far more valuable than keeping an ill-fitting garment. 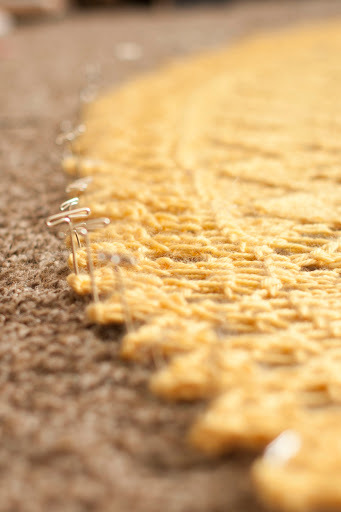 The discomfort that comes with knitting beyond a pattern was initially rather unnerving. I was used to knowing what my end goal was and having an idea of what I was going to be getting. However, I pushed to keep going, reminding myself that it’s the design process, the option of frogging remains. Such is the case with one of my current WIPs, a Christmas hat for a friend. 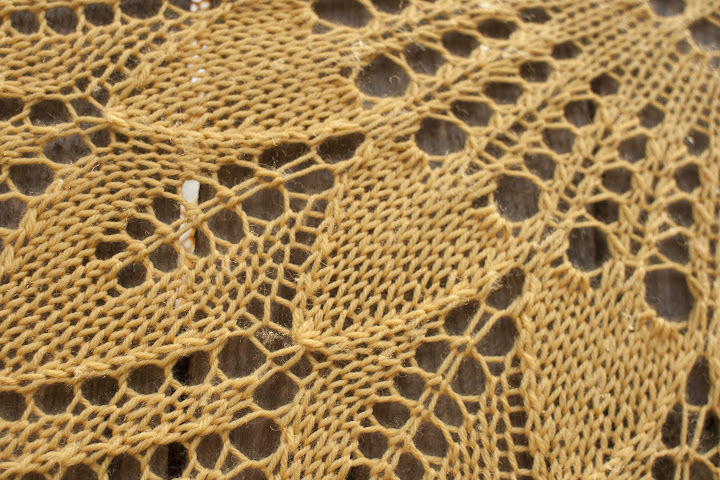 As I work on it on the bus, I’ll keep on checking the balance of the pattern…so far so good. Suffice to say, I’m satisfied with the ¾ outcome of this hat project but not ecstatic. And naturally, as any designer can attest, there’s more to perfect. And as with any other project with a hard deadline, sometimes one has to just give in to the satisfaction rather than the drive for perfection. From here, I think I’ll try to sketch out a more detailed schematic prior to beginning my next project. Then I think an extensive swatching process with greater attention to size will be needed. While I had attempted these project foundation pieces prior, I’ve realized a greater value in the process and find them to be even more fascinating. I truly feel doors have opened as I’ve stopped restricting myself…from myself. I’m still designing my crafting identity. And it’s all a part of this lifelong creative identity crafting. Lately, I’ve been inspired by a number of new blogs that I’ve come across by binge-listening to the Woolful podcast. If any fiber folk haven’t ever heard about it, I strongly recommend giving it a listen. Between the #slowfashionoctober series by the Fringe Association blog, the Stash Less series featured on the Craft Sessions, and all of the recycling and works by gridjunky, I really want to become a more intentional maker, with the idea of experiencing intentionality in a number of different facets. My first incorporation of intentionality is through the process of slowing down. I’m constantly casting on new projects because I want to knit everything. Even though I generally love all my items I knit since I get a lot of my patterns from Ravelry, I often fail to swatch properly due to the all to often swatching and getting a good enough gauge. This has led to frogged sweaters due to ill-fitting final products ending with no product and a lot of knitting time. Slowing down also refers to my finished objects. I’ve become inspired and would really love to build my knitting portfolio and display all my knitted items up to better heights, to keep better track of them. I think sometimes I’m in such a rush to finish up one project and start a new one, I forget to enjoy the finished object as it is. The photographic essays presented in the posts by gridjunky have really hammered home the ideas of slow process and careful thought. The images really evoke a sense of careful making while fully expressing the creative process, bringing a different life into each set of materials. This has in turn inspired me to become a much slower, careful maker, attempting to intentionally selecting designs and uses for each material as they speak their purposes. I think the ideals behind slowing down apply not just to my crafting but should be applicable to life in general. In today’s media-filled world, we are constantly inundated with new ideas, fresh headlines, and as a result our lives are expected to keep pace with the influx of information. Sometimes, especially when crafting, maybe it’s best to adopt the opposing way of life. So I’m pretty terrible when it comes to blogging on a consistent basis but I definitely still have been making! And lately, making lots more since my frisbee season just ended! But between the ultimate frisbee and the summer that is the absolutely lovely Seattle weather, I have little motivation to engage in screen time outside of my work hours. But let me try to pick this up…for yet another try. 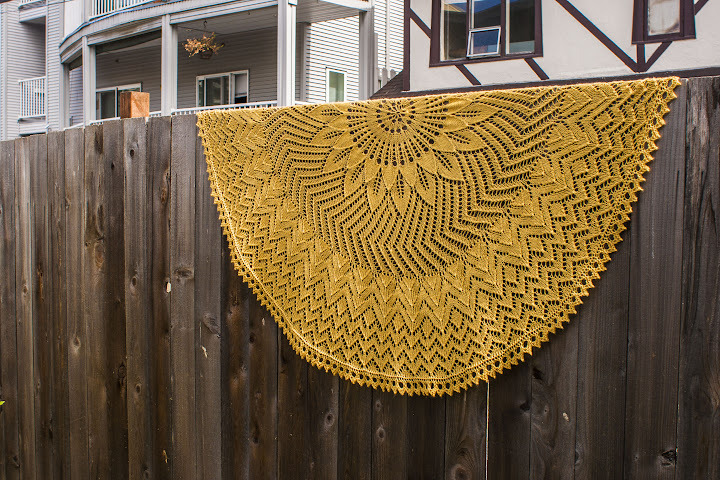 My biggest FO this summer was the Girasole shawl (but made into a circular blanket size) that took me the majority of this summer to create. Now that it’s en route to its owner, I feel like it’ll be ok to share on the interwebs blogosphere. I made this for my old roommate (I have SO much trouble calling her a friend because she’s so much more than just a friend to me) who I lived with while I studied abroad in Italy. She got married this summer and unfortunately due to both financial and frisbee reasons, I was unable to attend. Instead I chose to make one of my best and most intensive knitting projects yet. I’m normally a multi-project person. I usually am actively working on 3-4 projects at any one given time. 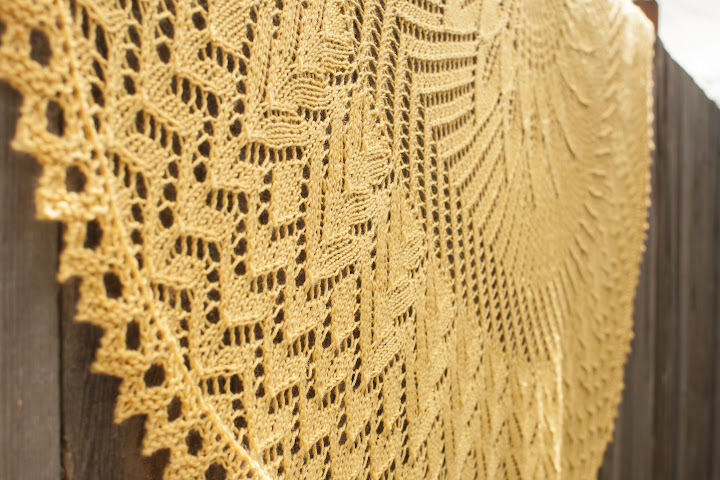 With this project, however, any time spent knitting was spent on this project. Definitely a great exercise in self-discipline. It traveled with me from Seattle to Eugene by car, to Ohio and Denver for tournaments, and Los Angeles for a work/family visit and now over to Germany for final gifting; definitely one of the more well-traveled projects I’ve worked on as well. It was quite a haul as it grew as well. 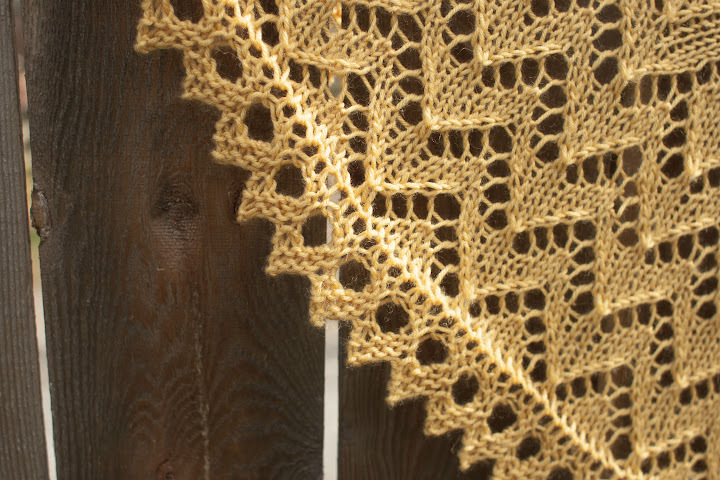 I’d never done a knitted on border with these points, but I’d come to really enjoy the technique. The only headache was that it was indeed a very large knitting project by the time I got to that part. One flight I was working on it from San Francisco to Seattle after a tournament and I was so tired that I ended up just curling up in it and sleeping under it instead of working on the border. 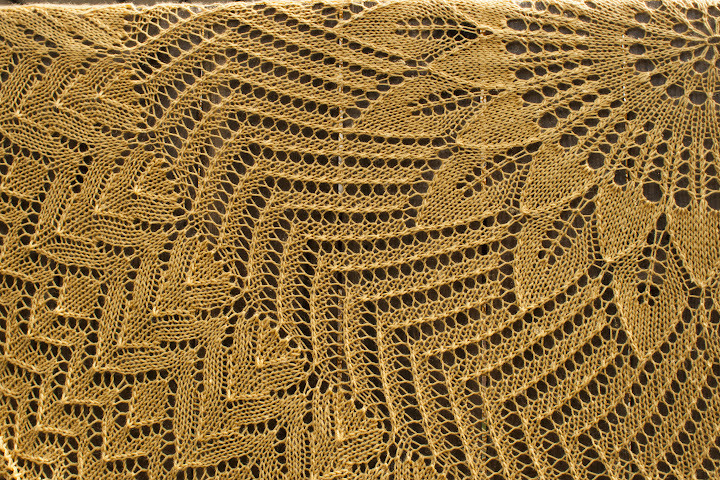 Still, despite the arduous blocking process, this is one of the most rewarding projects I’ve ever done. This is standing in the way of blogging and knitting and quilting and doing all the other fun crafty things. Stupid studying. Stupid professional exams. But check out those needles! They’re Knitter’s Pride Karbonz, and I have to say, they’re my new favorite needles. From the warmth of wood to the pointyness of metal all packaged with some nice flexibility and speed, I really couldn’t ask for more in a set of sock needles. I really wish I had discovered these before getting my Hiya Hiya interchangeable set, but hey, at least I discovered them. While they’re a little on the pricier side, for someone who knits as much as I do, I definitely recommend these especially for the long stockinette projects. Also, that ball of sock yarn…guess who’s starting her Christmas presents early! On the up side, my Mon Petit Gilet Raye is nearly finished, just some adjusting of the sleeves and some blocking/weaving in ends left! I seem to think that I’m bigger than I really am, both on the under arms and the size of the sleeves. Luckily, the waist shaping is spot on. Therefore I can use this as a model for future sweaters! Though it’s a loophole in my rule as well, I’ve already started swatching for my next sweater. I haven’t cast on for it yet; still following the rules! I do think I want to knit another one already though! So this blog fell asleep, hibernated for quite a while, and decided to finally wake up under a new address. But it has the same spirit, though new lessons and with more wisdom. But anyway, the new year is such a great time to reassess various aspects of life, and while this entry has been 26 days in the making (granted, my computer was in the shop for half that time, thus making it impossible to actually post), I’ve had some time to reawaken my blog and set some goals for this year, at least crafty goals. 1. Stash/WIP dieting: I think this is a major one that virtually every knitter has. But my yarn stash has grown considerably in the last year and needs to get smaller. Plus I need to start spinning what I have. I hope to purchase only sweater yarn over the next year, and that is for a total of (5) more sweaters this year (at most). 2. Blog twice a week: to me, this doesn’t sound very often. But looking at how long this has slept, this is a pretty lofty goal. Hopefully I won’t let the frisbee season take over too much and still deliver a post or two during the busy summer months. 3. Exploration of dyeing: do some fiber dyeing (yarn and/or wooly things) at least once a month. I forget how quickly I can set up the crockpot and colors and just leave it as I go about my business, and how satisfying it is. Plus having some sock yarn to dye will go perfectly with my hope to knit more socks this year. 4. Finish 1 cross stitching project: currently, I have a Christmas sampler in the embroidery hoop. Strategic placement of this project (next to my bed) hopes that it will get finished slowly by next Christmas so I can send it to my parents. 5. Complete my 2 sewing projects that await: I have one pillow case finished for my living room pillows that took me approximately 1 night after work to do. The other project is a DPN case that has been waiting since Thanksgiving. The former should be a cinch, but my procrastinating mentality always seems to get the better of me. Sure, there are only 6 up there. But the first is really encompassing and extremely general. So as 2014 goes by, we’ll see where I’m at. I currently have 100g of Knit Picks bare sock yarn in the crock pot and I’ll try to show you all later in the next post. I tried something new; rather than dump some color in the crockpot and see what happened, I soaked the yarn in synthrapol, put it in the crockpot, then used these squirty bottles to put the color in according to how I felt it should be arranged. I’m hoping this will create a tie-dye-ish self striping effect, but we’ll see. Not really. But I did go to Whistler this weekend. And it was simply delightful. Here are some of the amazing sights and sounds I was so blessed to see while I snowshoed and drove through BC. I definitely think I’ll want to take a road trip throughout British Columbia one day. It looks simply magical. The out of doors is cool. WOW. Can’t wait for this summer! That is all.